Isla Coronado is a small island off the coast of Loreto in Los Angeles Bay. The island offers spectacular sunrises and sunsets on its pristine beach, and is an excellent destination for swimming and sun bathing. The adventure seeker can hike up a path to the top of the dormant Coronado Volcano and enjoy the spectacular views and unique volcanic flora along the way. 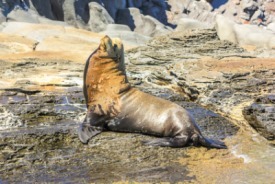 Those who wish to venture in the water will find excellent visibility in the turquoise waters, and might catch a glimpse of sea lions resting on small rock islands, or spot a whale coming to the surface. Isla Coronado offers beautiful coral reefs and excellent seabed exploration for the divers and snorkelers who make their way to the island.